Thanks for checking in for another great episode of my Real Estate Investing Mastery podcast. 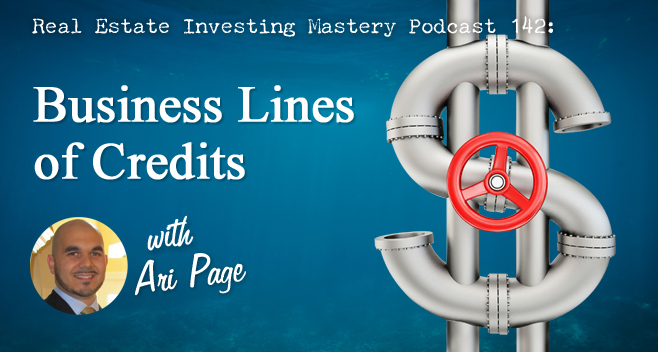 Today, I’m talking with genius money man, Ari Page, about quickly getting business lines of credit. This episode is packed with really important information about credit and how, specifically, it applies to you as an investor and especially wholesalers. Bottom line – it is crucial for you to have access to fast credit. So, Ari will cover the importance of credit for investors, and he’ll explain how his company Credit Card Builders (soon to be Growth Capital Advisors) works, what they can do for you as an investor, why you want them to help, the typical results his clients see with both good and bad credit, and much more. Business credit is looked at as less risky than personal credit. How great is that for investors!? Intro: Welcome! This is the Real Estate Investing Mastery Podcast. Joe: Hey, everybody. Welcome! This is the Real Estate Investing Mastery Podcast. Glad you are here, I’ve got a special guest today for the show but first I want to tell you, go to RealEstateInvestingMastery.com and download our Fast Cash Survival Kit. It’s going to give you everything you need to know – how to wholesale deals from the beginning to an end, how Alex and I use our virtual assistants, the marketing that we do, the systems that we built, how we wholesale deals, locally and internationally from anywhere in the world, how we wholesale deals with equity and without equity. It’s a great business, it’s a great time to be in this business and I know you are going to. If you are not already, download that Fast Cash Survival Kit you are going to really love. I also want to give you a shout-out to my new podcast that I am doing with another friend of mine, Tom Wade. It’s called The Remote Property Flipping Podcast. And if you go to RemotePropertyFlipping.com, you can download and listen to all our previous episodes. Right now, as if this is recording, we only have 5 or 6 that are really, really, good. Alex could not be with me on this podcast here. So you know, I was talking about the Fast Cash Survival Kit and that really ties in to the guests that I have on for a podcast today, talking about getting fast lines of credit. And I tell you in this business, whoever has money, or what’s the golden rule right? He who has the gold makes the rules. So it’s important in this business, in real estate especially, to have access to cash. And I want be talking about why it’s important, and I have a guest who we will be talking about that, why is so important to have access to fast cash as much as possible. So again, if you like the show, go to iTunes, leave us a review. Go to iTunes, do a search for real estate investing, you’ll see a show up there. Alex and I, can you believe it, we’ve been doing this podcast since 2011, that’s over 5 years. And it’s been quite a wild ride. We have a lot of episodes out there, if you go to RealEstateInvestingMastery.com you can see all of our past show notes. We usually get these podcasts transcribed as well, so I know a lot of folks, they prefer reading these interviews than actually listening to one of them. So if you didn’t know this already, if you go to RealEstateInvestingMastery.com you can get all of our transcriptions. All right, so, without any further, do I have my announcements out of the way? Ari Page, I have on the show with us today Ari Page who is from Credit Card Builders, soon to be Growth Capital Advisors. We just did a webinar about 3 or 4 weeks ago where my company REIWebinars.com was hosting Ari and his company talking about establishing business lines of credit. And it’s a really, really important topic for investors, especially wholesalers. And I know we have a lot of wholesalers listening to our podcast. It’s super important that you have access to cash, for various reasons. And we are going to talk about this as we are going through the interview. But RI, how are you? Ari: Well, I am doing great today Joe, thank you so much for having me on today. This is really excellent, I am looking forward to, you know, to talk into the folks about business credit and corporate credit. I mean this is something, you know, that I live and breathe and eat this stuff. This is awesome, you know, right now the economy really seems to be picking up. Ari: And more funding is really forthcoming from the bank. So we are having a great day today over here in Florida and thanks again for having me on. Joe: Awesome. You are in Florida and you help people in all kinds of industries, not just real estate investing, right? Joe: Yeah, you were highly, highly recommended to me from friends outside of the real estate space and that’s why we started talking probably a couple 3 months ago about dong a webinar, doing the podcast. Because I think this is really, really important. So, you know, before I start, I want to ask you questions about what it is that you guys do, why it’s important and how, people got to think that get really intimated and overwhelmed when they think of getting business lines of credit. And they think that they have to have perfect credit, they think that they have to have all the docs lined up in the row and they have to be flawless to get business lines of credit. That’s not really the case is it? Ari: Well, actually people’s perception of that that it’s difficult to get is actually a well-earned reputation considering that the banks don’t make it an easy process. And so it’s kind of, you know, what advisors do, which is you know, cut through all of this, all the BS involved and take people who already have good credit and show them how they already actually do qualify for this type of funding. Joe: Right. And you even helped with credit repair if they need that, don’t you? Ari: Yes, in the case of the client, there’s a separate company that we work with that we help clients do that. And there are a lot of credit repair companies out there and you know, there’s some that really get great results and we’ve aligned ourselves with a company out there that can really get results so that we can move forward. Our goal of course is business credit and if that appears on the clients’ credit report, but they do want to look at the business owners’ personal credit before granting them the business credit that reports to the tax ID. So you know, we kind of have a little cross over there with personal credit and so, you know, we have established relationships that can help a lot of our clients out of situations where they have derogatory and late payments and foreclosures or charges that have to be deleted. We get those removed all the times. Joe: Good, excellent. Well, let me explain why this is so important and why I wanted you guys on the podcast. A lot of our listeners are wholesalers, in other words, you guys out there you are flipping deals. You get them under contract and you sell a contract. Many of them aren’t even buying the house and you couldn’t even buy the house if you wanted to. Which is fine, all right? You are just getting a property on the contract and you are flipping that contract. You are either assigning it or you are doing a double closing. Here’s the problem though, and I am hearing this more and more, all throughout the country, especially in states like Ohio, Tennessee and Florida, where local real estate commissions are really cracking down on wholesalers. And I am predicting, a lot of my friends are predicting that it’s become, you know, in 3 or 5 years or less, wholesaling may be illegal. Now, I don’t say that to put fear into anybody and hopefully I am wrong, in fact don’t even quote me on that. Don’t even quote me on that, because I hope I am wrong and I probably will be. There’s nothing illegal about selling a contract, I can argue that in front of the real estate commission until I am blowing the face and I’ll never win that argument, right? Because it’s all in the intent. And this is what is getting these real estate commissions all fancy and uptight, okay? A lot of wholesalers are going out there, putting offers on contracts, putting contracts on property and they never have the intent to close on it. They put things in their contracts like this contract is contingent on me finding a buyer, okay? Or they use brokering language that I am going to find a buyer for this house. That is brokering and it needed a real estate license to do that. Okay? So here’s the crux. 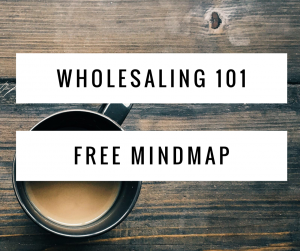 When it comes to wholesaling, you have to have the intent and the ability to buy that house if you wanted to. If you change your mind and you say, “You know what, let’s find out, I don’t’ want to buy this house anymore.” You can sell that contract, okay? That’s not big deal, okay? That’s called wholesaling. You sell your contract, you don’t advertise the house, you advertise the contract, okay? We’ve talked about this a lot before on previous episodes. By why is this so important to be talking about business lines of credit, is because so many new investors out there are struggling to get, to prove that they could actually buy the house or they are struggling to even be able to buy the house if they had to. “And you know what they do? They are just going to take your contract, they are going to market it up and they are just trying to sell it to another investor. But me, if you sell me your house, I will actually buy your house, I could buy it right now, and when I am giving you this price, I am committing to buy it, okay?” Do you see the difference there? And I guarantee you, your competition that it’s out there talking to sellers, these guys that are full-time wholesalers, doing a lot of deals, that’s exactly what they are doing, all right? So what if now you knew that you could actually close on that deal? And if you had to close on the deal, do what’s called transactional funding, right? An A to B, B to C close, double close, you don’t have to use transactional funding. I was looking at a deal, the other day Ari, with an investor a client brought to me, to partner with me on a deal. And it was a $450,000 that worth about $650, so it was a good chunk of equity right there right? And so, we didn’t want to manage rehab and do that whole process, so we looked at doing transactional funding, which means borrowing money from a hard money lender or transactional lender, okay? And using that money, for like, 5 seconds, to buy the house and then immediately turn around and sell it to the end buyer. Guess how much it would cost to borrow that money for just 5 seconds, 3 points, which is I forgot the number I calculated, it was like $13-$14,000, okay? That’s a lot of money, but if that means if that what it takes to get the deal done, than you just got to do it. But what is you had access, now that’s a lot of money I mean most guys that are wholesaling deals are not going to be dealing with properties in that price range. Usually it is going to be in $100,000 range, let’s say. But that’s still, if you needed $100,000 to close on a house, that $3,000 on the low in that a wholesaler has to pay to a transactional lender, all the money so that you can close on the A to B. So if you had access to lines of credit where you can actually close on the deal with your own money if you wanted to, save $3,000, flip the contract and have an extra $3,000 in your pocket that you can use for your next deal, all right? So that’s why this is so important for 2 reasons, number one you need to be able to prove if the real estate commission is starting to cracking down in your market, okay? And they started saying, “Hey, you had this contract and you are now advertising this property, you had never had the intention to buy. You never had the ability to buy.” You could show them, “No, I could buy it. Look, here’s my basic business lines of credit. I could actually buy this house if I wanted to,” okay? So that’s number one. And number two you don’t have to use transaction funding. You don’t have to worry about getting fake proof of funds letters from other companies, so that you can prove that you actually have the money. You know, I’d say fake, they are not really fake, but it’s like every other wholesaler out there that is making offers on the MLS properties, not everyone, but a lot of them are using these quote on quote fake proof of funds letters to close the deals. But what if you could actually have real proof of funds, real bank statements that show you, you have access to these lines of credit, if you could actually close on a deal. So you see what I am saying guys? Go ahead Ari. Ari: Have a real ability to actually purchase what you want. And then they leave and they go sit down. Or an attorney would say, “Listen guys, this is Tennessee. In the last year I defended 25 wholesalers that the real estate commission went after because they were brokering without a license, all right? They had no intention, no ability to close on these deals, and they were advertising houses without a license. They had things in their contract that says this contract’s contingent on me finding a buyer, they had language on their websites that showed them that they were brokering, so don’t do it guys.” And he said every one of those 25 lost in their arguments, okay? They couldn’t argue that they were principal, they had equitable interest in the contract. They were just selling the contract. They all lost. So either one, get your license or number 2 get the money so you can close on these deals if you have to. All right, sounds a long introduction. I wanted if you just kind get out there to get people to understand why this is so important, why I am so passionate about it, because people out there they need access to funds. And if you don’t have enough money in the bank and you don’t have a good investor, I mean a private money investor, or if you don’t have access to hard money, you need access to your own funds. So that’s why this is so important and Ari, your company is called Credit Card Builders. You are changing the name to Growth Capital Advisors. I like that better. This isn’t just about getting credit cards, it’s about helping in smalls businesses like real estate investors, get capitals so that they can grow their business, right? Ari: Exactly. And it’s important that in the process of attain capital that we don’t create asset protection problems. And so our entire crux of our programs is to gain capital but help the company grow in a responsible, sustainable way where they are not putting any of their assets at risk by gaining access to funding. Joe: Right. So, and the other cool thing about these too is a lot of these business lines of credit, is that zero% interest, at least the introductory rate, right? Ari: Exactly, that’s one of the things that we are really good at is utilizing the introductory rate score and it could be anywhere from 6 months that 0% to the longest of the business accounts or 18 months as 0%. Now one of the things that we are really good at doing is what we call flipping these accounts. So, you know, the most basic way to understand would be that we would apply for a new account and use a balance from one 0% account to the new account when the old accounts, 0% is about to expire and the interest rate is about to hit. But there’s other ways of doing that too. And you know, we get kind of in depth in now, on our seminar like we did couple of weeks ago Joe. But you know this is part of our specially at extending these 0% rates and we are doing it all the time. We have clients that are getting $95,000 credit accounts on one credit account. And that happens through negotiate it. Joe: Let’s talk about that. What are some of the typical? I want to talk about what are the typical results that your clients see. And honestly guys, let me just tell you right up front, Ari and the Credit Card Builders Company do charge money for their services, all right? Of course, they would. So they charge a lot of money, but I am telling you it’s worth every single penny and at the end we are going to give you an opportunity. I am going to give you a website you can go and get more information on what they do. So, Ari talk about, what are some typical results or average results that you see that you can give to your clients and give maybe an example of somebody with really good credit and somebody with bad credit. Ari: Okay, perfect. So, as far as average results, we are, you know, are guaranteed, so we are going to get you at least $50,000 and most clients are getting up to over $250,000 just simply by using the program. The more you use the program, the more your scores are in hand, the more your business credit is in hands, the easier is for us to get you more credit. And so, if you only want a little bit of credit, then of course, you know, we get you the amount of credit you want, let’s say $50 to $100,000 and then you tell us hold us on credit and then so we flip and keep those accounts 0% long term. So some clients want as much credit as possible, some want to just keep it long term on 0% what they have. Now let’s say that you have a 730 FICO score and you get started with the program. Well, you are in a high credit range, we are going to be able to move forward right away, start applying for you, clients that are coming in that range, are looking at receiving around $100,000 in the first 30 to 45 days working with us. Ari: And clients that are below the $700 range, are you know, receiving anywhere from $30 to $50,000 on the first round of funding. Now, it’s really important to understand that our program it’s based on us doing work over a period of time. Not all of your funding comes in in the very beginning. Joe: All right, this is so cool because, the other day, guys he already showed me on his computer, I saw his screen, he showed me, you know, he had just like pages and pages of spreadsheet of all these clients are working with, right? And they have different columns for the dates, right? And he was showing me at the beginning, all these columns with 0s and after it was like 5, 6, 7 weeks or tries or whatever and he started showing me actual approvals from lines of credit. I just, I laughed when I saw it, that’s so amazing. So anyway, what were you saying? You go back and you kind of, you just do this several times, right? Like you go back after they even say no. Ari: Exactly, so we have what we call different rounds of funding, or we also refer to them as a batch of funding and in each round of funding we are going to apply for 4 or 5 of these loans. So we are going to 4 or 5 institutions, at the exact same moment, at the exact same second, putting out the applications exactly at the same time so that we can maximize the good credit that the client has and get a lot of credit in a very short period of time without stumbling along and letting one bank know that we are asking another bank and then that bank knows that we were asking another bank. And then at that time, it becomes a problem. So we do it all in a very rapid time, and of course, before we even apply for the client, they come to our consultative process which is very comprehensive and if a client has lower scores, we are going to have each of those scores before we even apply. So in this scenario that we are talking about right now, we are talking about a client that already has big credit. So they’ve gone very quickly to the consultative process, because they already have big credit, and now we are on to the applications. So we put out 5 applications for them and then the negotiation process starts. It’s very common for 4 or even all of the accounts to come back the client when we apply for 5 at one time. But all, every single one of those accounts, will be approve by the time that our people are done calling the bank, talking to the underwriters, you know, they are hearing out what their concerns are, providing any documentation that the bank should ask for which is all very basic information, and by that time we are done, we have approvals. So now only we do have approvals, but we are going start negotiating them. So if they approve us for a $15,000 account, we are going to take it but we are going to tell them that we wanted a $50,000 account, not $15. And they probably won’t give up the $50 right away, we’ll probably have to go and first maybe get a $20,000 or $25,000, so we continue the negotiating process. A lot of people don’t realize that by calling the back, by talking to the underwriter, you can drastically sway their opinion on how much they choose to lend to you. Many people they go and apply for something, and whatever the bank tells them, that’s what they walk away with. If the bank says you are approved for this amount, they say okay. If they bank says, you are declined, they are okay with that. You know, with us, it doesn’t matter what decision the bank says, we follow up and find out why they made that decision. Why where we declined? Why did we only receive $25,000? And there’s always a reason, and you work on that reason, and you can provide information that shows the bank, that you are, you know, lendable, that you are worthy of receiving more funding and then they will up your limit. So many times have already received their credit cards in the mail, through our program and one credit might take $20,000, one might say $15,000. And our consultants are emailing them, telling them, no that card is not actually $20,000 card, it’s actually a $45,000 card, because we’ve already we negotiated it. And the amount of time it took for the bank to send it to your address, which is about a week, our negotiators have already negotiated it twice, and it’s already actually a $45,000, not a $20,000 card. And that happens all the time, and sometimes the clients are: are you serious? Are you joking? Well, go ahead, log on, go on the website, check it out and it’s really a lot of fun and it just has a little interesting side note. Our negotiators actually are paid based on how much credit they get for the client. So the harder they work, they more credit they get, the more they walk out with on their pay check. So we are really incentive internally to produce the most amount of credit we can for every single client, whether they are doing our membership or whether they do it as a pay as you go option. Joe: Excellent, so I love how you don’t even want to take no. Your negotiators go back and ask again, you know, ask what’s wrong and you improve the application. But you just don’t quit or give up. That is really good. Can you walk through, kind of how does the whole process work, how does it all start Ari? If somebody fills up, you know, they sign up for you guys, how does the process start, what do they take them through? Ari: Perfect, so when the client first gets started with us, they are going to be on the website and fill up our membership request forms and then they submit button. And they receive an e-mail that has a user name and a password. So they go back to our website, they log in and they can fill out the loan packages all done online with e-signatures, and so it’s really simple, it will take them probably about 25 to 30 minutes to fill up all the documents needed, they can e-sign all the docs that require signatures. Then they schedule there, what we call, the initial consultation. The first consultation and that consultation is where we go over the client’s whole profile. We are able to tell them at that point exactly how much credit we think we are going to get them on their first batch, how much credit we are going to get on the second batch. We are able to tell them if there is anything that we can in order to boost their scores, at that time we may be talking about different partners, because our program allows for multiple partners. A business is not usually just one partner. Usually there are multiple people in the business. And so we actually allow for multiple credit partners in order to maximize the amount of funding we get for any business. Joe: Oh, I remember talking about that on the webinar. So, expand on that a little bit. Let’s say you have a terrible credit, but you have a business partner who has good credit. Joe: You can actually get lines of credit for your company that you both can use. Ari: Exactly, and at the same time while you are doing that, it also helps you rebuild your credit. So we have clients all the time who… Their personal credit may not be so great, but they are married or they have a friend who has good credit, or you know, I mean we have clients who use their adult children or used their parents, or used a cousin. Any person who has good credit and is going to work with you can be your credit partner. And the credit as long as it is used responsibly, will never show up on their personal credit. It will report to the tax ID number of the business. And then you can end up, you can add on the primary or the secondary to that account so that even though one person, one of the partners has that credit, they are still building a business credit profile, because they are added as an authorized used on to the business account of the good personal credit guarantor. And so it’s a really great process, especially, you know, if you, yourself, don’t have the best personal credit, just add a partner. There are no extra costs, you are going to get funding role in right away and we are going to help you work on whatever is holding your scores down, whatever reason why your scores are low, we are going to fix that. Joe: Yeah, amazing. So, there’s a process when somebody signs up, they fill out an application, then get some information. You get on the phone, you actually talk to them. So you are actually counseling folks through this process right? So you are not just sending them an e-book, making them read a bunch of stuff and do a bunch of things, you are actually, they have somebody they can call and talk to, right? Ari: Yeah, there’s a lot of counseling that goes on during the process but the best part is that our people actually do all the work for you. So while we will tell the client, every step of the way, exactly what we are doing and we don’t move forward until we have their permission. We are still doing all the work. Ari: And so after that initial consultation, after they had talked to their advisors who has, you know, told them how much credit they get, I am sorry, how much credit they think they are going to get, you know, on the first batch and so on. At that point they would then move into applications and negotiations. So then we move forward and if a client has a good credit back to our original scenarios, if a client has good credit, then within a week to a week and a half they are already in applications. And so application we then move, we apply for them, and then the negotiators start calling. They start talking to the banks on their behalf and of course our negotiators first examine the file, they know everything about the client’s business, about the client’s industry, about the client situation so that they can really represent and negotiate the best for that specific business. And so then they get on the line with the bank and they start negotiating with the underwriters, so that’s when we are extracting the gold. That’s when the real honey comes because we are able to talk to the underwriter and maximize the overall amount of funding that the clients’ are getting, I mean there’s times when we get $45-$55-$65,000 credit line and initially the client was declined. So that’s $65,000 in credit when initially the client was declined, that’s powerful, that’s huge and we do that all the time. It’s not something that we are just sitting around and talking about, that’s what our negotiators are on the line with Bank of America, Citi, Chase, Synovus – to know this all of these different banks offer the 0% business credit cards that are unsecured. And so that’s a really a way the banks want to get funding out. I mean there’s other ways to getting access to funding, for example mortgages and car loans and business lines of credit and so oneself work, but these other forms of funding are highly regulated by the government and they are very costly within the industry. And so it’s the banks, had actually, want to push funding out through these unsecured credit cards. They want to push them out through business credit cards and they want to push it out through personal. But the great thing about the business credit cards is that clients that qualify for business credit cards generally are paying back their lines of credit at a much higher percentage than personal credit users. So personal credit users default on their accounts more than business owners. Ari: So when you apply as a business owner for a credit card, immediately you are putting yourself into a less risky category. How great is that? So there are many little misnomers and things behind the scene that people don’t realize that they can use to help position themselves when applying for these types of loans, because a lot of people apply and they say, “Hey, I can’t get the 0% account, I always get the card.” And we tell, you know, you are not alone in that my friend. It really does take a lot of work, you know, to qualify and get approved for these accounts. And they are out there except there’s just for the top, top cream of the crop and what people don’t realize is that you can qualify for that because it’s just credit face. So, although your credit, in this moment may not qualify for it, after we changed, you know, after we worked on your credit massage and we did the we-know-how, you will qualify for them. And you could also not be a credit problem; it could be an entity problem. A lot of people get declined for a loan, not because of the credit, but because of the entity information and the way the entity was presented. So it’s a total picture. Ari: We send to the bank a total picture that we have to present perfectly. We don’t get any second chances. Joe: Talk about, you know, after the 0% interest, what is the cost of this credit? Ari: That’s a really good question. There are 2 different scenarios. There is the main scenario when a credit account of 0% is about to expire when the client contacts us. And then we decide if we are going to, you know, exactly how we are going to get more credit to move that best balance to. And so in that case we may end up apply for another card, we may go back to the same institution, get a credit limit increase, there is a variety of different things that we might do. So in that case, if a client is in our program, and the 0% expires, then they don’t worry about it because they know we are just going to get more 0% money, more 0% credit to move it on to. So now I would say that a client was in our program but not they are not in our program. And so their 0% when it expires, it’s actually you know, an interest rate is going to hit. They don’t have the protection of being one of our members. So in one of those situations, the interest rate could be anywhere from 7%, I mean we can see as highest 13% on some of these business credit cards which seems high, but there’s you know, I can tell you there’s a lot of other business lending products that they are like merging factories, and then angel investing, and all of these other types of investment that end up being much, much more costly than even paying the high side of 13% on a business credit card. Joe: That’s still probably when you are factoring all of the fees. It’s still probably cheaper than hard money loans. Joe: Excellent, now all of the stuff that you guys do, couldn’t somebody do this themselves? If they are interested in getting business lines of credit, couldn’t they just find a bunch of business credit cards and apply for them? Can they do these themselves? Ari: Well, you know what? They actually could, but they would have to know a whole a lot about our industry. They would have to know exactly what credit factors the banks are looking for when approving business credit cards. They would have to know which banks offer credit cards that don’t appear on your personal credit report. And I remember, you know, during the seminar, we talked about extensively a 35% golden rule. When you go over 35% at any specific credit limit, your score start to come down. And so, there’s a very good reason why you need to keep these accounts from showing up on your personal credit and there’s many lenders out there that call their accountants, business account, but then they still report to your personal credit. Ari: So as soon as you use it, it pulls your scores down. So there’s a whole myriad of other factors all involved, other links to the chains, that should you get wrong, you are not going to get access to funding for example, the entity. Many clients want to go to the banks, using their real estate entity. Well, guess what, the banks don’t really want to lend out a lot of money right now for real estate. And so what we have to do, we have to take our clients and brand them an industry that is still, you know, in line with what they are doing. So for all of our clients that are looking for business credit, they are already business owners. And what we do is we rebrand them as a business management entity, business management, because they absolutely manage a business. They manage their own business. And so these business management entities are highly lendable. Highly lendable! And for someone to know how to go and set up one of these on their own, I mean there are people that they do know how to do it, but at the same time, we know how to do it, you know, we pretty much primary this process of first of all, helping a client create a rock solid personal credit score, a rock solid business credit score, as well as, the little known corporate credit score. And being able to then leverage that and get access to a lot of funding that is not going to show up on their personal credit report, that’s highly asset protected, and as well as being unsecured. And then of course we also had, you know, for our more advanced clients, we have absolutely non-PG funding. It’s not personally guaranteed, will never come back on the client personally or even under business, excuse me, it will only come back on their business; will come back on them personally. So this non-PG is really the cream of the crop, the top funding that all businesses want, where the business owner has nothing to do with personally guaranteeing the loan, where even if they should default, it will never come back on the business owner. That’s 100% in the businesses’ name. So for us, recently, you know, our company, we bought our office building down here in Florida. And you know, we didn’t have to put up our personal credit, you know, me as the owner I didn’t have to PG anything, it is 100% based on our corporate credit rating. And in the horrible event, if we should be unable to pay for that loan, it would never come back on me personally. Ari: And so, you know, these aspects of investing are really, really important for long term sustainability and viability. So when it comes to loans, the first thing on your mind should be asset protection. What happens if I can’t pay this properly? I have to make sure that I don’t lose anything and that’s one of our big plus. So our company name is Growth Capital. It’s not just about capital; it’s about overall business growth. We don’t want to just create funding the capital. We want truly nurturing help the businesses that we work with grow. Joe: Very good, very good. What are some uses that investors can use for business lines of credit? Specifically, you know for, it could be in general for business owners, but what about specifically for real estate investors, can you think of? Ari: Well, we have clients using the business lines of credit for, I mean, a wide, wide, variety of things from going to seminars to buying rehab materials, you know, at local vendors or paying our contractors. We have clients that prefer just to write the balance transfer check and just to pause all the money right into their account. And then they just, they want to just automate $150,000 from the business credit in their business credit account and so they can spend it cash. So we have a lot of different scenarios of our clients do. A lot of our clients love investing in passive income generation vehicles. Ari: And so, you know, there’s a whole wide variety of what they can use it for, in real estate, you know, the obvious it could be to be used for buying and flipping, you know, short term and it really makes sense for short term money considering the way of 0% loans. But then we also have clients that want to use it for long term. We have many clients that stay with us year to year, so we continue putting the money at 0% or keeping the balances at 0% and then they are able to invest in whatever, you know, earns their company the max ROI. So there’s a whole variety different ways, and Joe you could probably even expand on that, because whenever you can spend cash on, or you know, Visa or MasterCard, is what you can use this funding for. Joe: Yeah, I just want to make sure that folks, don’t and I know that nobody listening to this is thinking this, but this is just another way that you can go and buy some fine things and take a vacation or this is something that you need to invest in your business, and I am not about people getting into more debts. But this is something that you should buy, produce cash flow, a passive income, some kind of asset that is going to generate revenue for you and your business. And you should pay it off as quickly as possible and just cycle through that money. The cool thing about this is that you don’t need huge lines of credit, you know. You don’t need a tone. What is a tone? I don’t know. What’s a small amount, I don’t know. But this is something that can help a lot of people buy or rent a property and hold it for a year or two and then cash out, refinancing with the bank loan. Or just hold a property for 6 months while they fix it up and then sell it to pay that credit card off and you know, do it again. But, what are some common mistakes that you see people make with these business lines of credit? What are some things that you think people shouldn’t do, Ari? Ari: Well, you know, one of the common mistakes I see is clients that come to us that have already gone and spent a lot of money on their personal credit cards. So they like the idea of leveraging credit for their business and they may have spent a lot of money on building their business, but they used their personal credit accounts. And what it ends up doing, is that it ends up brining down their overall lend ability, and then they are just, you know, basically squeaking by, making minimum payments, paying max on interest and not even able to really you know, fix the situation. Ari: “So your scores stay high and you have access to the funding and we can continue to flip the current accounts because your scores are staying high.” So it’s really important that in the full process we keep your personal scores really, really high. That’s the only way that we can be able to continue flipping the 0% accounts and you know, getting more and more of these accounts. So that’s one of the common problems that we see is clients using their personal credit, maxing it out and take their scores and then they wonder how do I get out of this hole. And we’ve actually very effectively helped many clients like that, kind of moved their balances from their personal accounts over to new business accounts. And even if they we were only able to establish a very small amount like $20,000-$30,000 at a time on each batch, because they are so maxed out on their personal, you know, even moving $20,000 off to your personal, it allows the scores to come up a little bit. And then we get another $20,000-$30,000 on our next batch and then we can, eventually, you know, we’ve got some clients, that you know, $100-$150,000 of personal credit card debt. And we’ve got it moved over from the personal over to the business so that their scores can build up and not only are they being able to get access to more business funding, but then their insurance is cheaper, you know, how many things now check your credit? I mean there’s so many different scenarios where other companies want to check your credit especially for B2B services and so keeping the clients’ credit scores not high, it’s not only good for their everyday life but it’s also good for our job of getting them access to more credit. Ari: There’s other challenges that clients run into, when looking for business credit, you know, where they, you know for example, a lot of clients that have good credit, you know, figure, “Hey, it should be easy for me to get access to business funding.” And one of their common problems that they ran into is that they may be an investor that might have multiple mortgages on their credit report or you know, an investor generally has used their credit a bit heavier, and so they may run into the problem, you know, finding that they have access to credit, they used credit, they have a fairly good credit score but the banks don’t want to give them unsecured business credit cards. And there’s many reasons as to why, like in our webinar, when… in debts that explaining why people with good credit can have a hard time getting access to this type of funding. And so that’s another thing that people all the time have a problem with. And you know, there’s a million of different things that happens on people’s credit reports on the way that their existing credit cards report, remember we talked about the open card, the way that people’s existing credit cards can report to their personal credit can be very damaging to their overall score. Or if you had a mortgage, that where the mortgage company was bought out by another company recently and many, many of the folks that have mortgages, their mortgage holder was bought out by another company. And then all of their mortgage seasoning was reset, they lost all that history. And so suddenly their score tanks, even though they… you know, their loans opened successfully and without missing any payments for a long period of time and then suddenly lose all that. And if I would, I mean that’s 2 minor things on people’s credit reports and there are like 100 others. And that’s what our consultants do for any giving client, as they go through and the look at all of these little stats and statistics and variables that greatly affect someone’s chance of receiving an approval or being declined and not receiving any approval. Joe: Yeah. Are there any tax advantages to using business lines of credit? Ari: Yeah, absolutely and first and foremost is a lot of clients’ questions are, you know, do I have to bill taxes on this new entity that you guys create for me? And do I have to file a tax report, every, you know, do I have my taxes every year, you know, for these business credit cards? And the answer is no. No, no, no as far as tax, tax implications, the only implications is positive, there’s no… For example, you only pay taxes on earned income. You do not pay taxes on borrowed money. You only pay taxes on earned income. So this is borrowed money, no taxes are due on, number 1. Number 2 this is a tax write off, because our service costs you money and it’s for your business. Our service fee is actually a tax write off, for you. So you’re getting access to this credit is a tax write-off and then you get access to the funding to invest in your business. Now, only after you’ve invested the funding in your business, and generated a return, do you pay taxes. You pay taxes on the net profit that you generated, you know, from using the loan. So there is no taxes directly from the loans, it would only be on profit that you generate from using the loans. So it’s a wonderful system, you know, of course in the US they don’t tax loans. So you’d only pay the interest rate and in this case is a 0%. Joe: Very good. Any other closing pieces of advice that you would want to give to people Ari, who are interested in maybe trying to get some business lines of credit? Ari: Well, Yeah, the ideal client to use this type of funding is somebody who already has fairly good credit scores, you know 700 or above, and has it really heavily leveraged at itself so that they are not already, you know, they don’t already have a whole bunch of maxed out things on their credit report. And a lot of folks that are in that range don’t really believe that they can get access to business credit. And so, one of the things that I encourage folks, especially a lot of the small business owners out there, the folks that are buying and flipping, the rehabbers, the hair saloon owners, the pizza shop owners, like all of these small businesses. If they only realize how attainable getting access to business funding really is, it goes right back to you. So when we started this call Joe, you mentioned that a lot of people get nervous, they get scared when they heard that word, business lines of credit. It’s a sound intimidating. It’s really as simple as getting access to a credit card. Ari: It’s kind of like a credit card; it’s just a credit card for your business and there’s part in airline, miles and cash back and all that of course, we didn’t really talk about that yet, but there’s all that. But now, we are just talking about getting a credit card and leave it up to us to just figure out which account is not going to show up in your personal credit report, which one has the longest 0%, which one is the easiest to extract the cash off your card. All of these things are things that we’ve already figured out for you. So for anyone out there that already has good credit, it’s really extremely easy to get access to this funding as you know what you are doing and even those who want to have less credit. It’s not that difficult, I’ve got to tell you myself Joe. Me and my wife, my wife Maya, we have bad credit, we fixed our credit. I remember from college, Joe, I had 32 derogatory accounts on my credit report. And now when I applied I get approved for $50,000 accounts. I just got approved for $50,000 account… 21 months at 0% on that personal credit card. That’s even longer than the business offer. The longest business offer at 0% is 18 months. So now that is even asked her I had 31 derogatory, or might have been 32, even though it was a lot of derogatory from when I was younger. So we worked through that all those derogatory deleted, our scores… We go through our own process which is credit building, make your personal score rock solid, build the business you know to a rock solid standing so that you can gain access to even more credit, and you know, I am, me and my wife are perfect examples of many of our employees, are perfect examples of having credit that was in shambles and now being able to access as much funding as we want. I mean I can’t even tell you the amount of business credit cards that I have, I don’t even use. I don’t know what to use them all for. I mean, I have so many of them, and so easy to access that once the ball is rolling I really want to encourage, you know, the folks out there, if your credit isn’t’ that good, get started on fixing it. You could fix it yourselves. You can have a company fix it. You can call us; we’ll help you fix it. Ari: So get started doing it. Me and my wife are are happy that we did. Now we have access to a lot of funding and for those out there that already have good credit, well heck, you are already 3 quarters to the way there. And you got to start doing and building the credit and we’d be happy to do that for you as well. Ari: Thank you Joe for putting me on this wonderful podcast that has me on, I really appreciate that. It’s been a lot of fun, you know, hanging out with you here. Joe: Well, I hope you guys and I apologize for the bad audio connection, maybe it’s just on my end. But you know, if this isn’t something that’s for you right now, that’s totally cool and I hope you learned something out of this podcast. It’s sounded a little bit more like a webinar but it’s something that I think it’s going to be really important for everybody listening this too, get a grasp of and start thinking about because if you need access to funds to close a deal, or to be able to prove that you can close on a deal if you wanted to, it’s really important to do this. You know, let’s say you have a 12 rental properties, you have 12 rental properties and all of the sudden one month you have 3 vacancies, all right? And you eat up your reserves, then in a month or two and you are hammering cash well, you can access business lines of credit. Business credit cards like this to help you get out of that and lived to see another day. I mean, this is really important and even if you don’t use it, it’s important that you have access to it in case you needed it for emergencies. So I thought it was really important to get Ari on the show, talk about these issues and if you are interested in that I have a link. I am going to give you guys a link, if you go to REIMCredit.com, that’s for Real Estate Investing Mastery, REIMCredit.com, that is my affiliate link, it will take to Ari’s company’s website, you can take a look at it. It’s not cheap to do this, okay? It’s not cheap if you have really good credit. What is the cost, Ari? If you have a really good credit, I think it’s 7th, I don’t have my website open here. Joe: Yeah, I am getting a bad connection, Ari. I am sorry, it’s probably on my end, but we did offer a $500 discount to everybody who wants to get into and sign up with Ari and his program. So instead of $3,500 it’s $3,000 and if you have a higher score than I think 730, you don’t have to pay anything until you actually get the results, all right? Ari: Well that’s if the client wants to go with the back end funding program. So these are 2 separate programs. So the back end funding program you have to have a 730 FICO or above in order to even join that program. So if you don’t’ have a 730 FICO or above, then you have to join our membership. And our membership is going to help you build your credit. That’s going to help you increase your scores, so if you have a 730 or above you can join either of the 2 programs. If your scores are below the 730 then you will need to join the membership and the membership will help you raise your scores as well as get you access to business funding. Joe: Yes, very good. So if you want more information guys, go to REIMCredit.com, for real investing mastery, REIMCredit.com. And then you go to our website and go to the show notes and all the links are there, RealEstateInvestingMastery.com. Ari, thanks for being the guest on the show, thanks for talking about the stuff, I hope people take this seriously, take advantage of this. Just take a look at it, start thinking about it. Don’t put it off any longer because this is something that’s going to help a lot of people grow their business. And maybe it’s that house you want to buy a house and it’s starting giving you cash flow from another asset. Maybe it’s you know you need to invest for some new marketing for your business. There are a lot of really good useful things that you can do. Maybe it’s education, maybe there’s something that you’re interested in. I believe 100% in investing in your own education. So, cool, Ari, thank you very much, I appreciate it. Ari: Okay, thank you so much Joe for having me on, thank you to all of our listeners, for listening to this very dry topic that you know, for an investor it’s pretty exciting. Joe: It’s really good stuff. REIMCredit.com, REIMCredit.com. All right, Ari, take care, see you later.